Whew! The Autumn 2013 Bicycle Quarterly is at the printer. The team hears me complain about how much work it can take to publish a magazine, but they seem to cheer up when I have my moment of “This really is going to be the best issue ever!” Indeed, it really is an outstanding issue filled with the passion for the sport we love. We tested two exciting, brand-new products. At this year’s Interbike, Calfee will present a new 650B Adventure model, fully equipped for randonneuring with lights, a front rack and wide tires. And SRAM introduces their new Red 22 with the long-awaited hydraulic disc brakes for road bikes. Before these new products headed to Interbike, we got to test them. Bicycle Quarterly tests are much more demanding (and we think more fun) than the average magazine review. We took the Calfee on the most challenging ride we can think of, the Volcano High Pass 600 km Super Randonnée: Almost 400 miles, more than 35,000 feet of elevation gain (below), and almost 1/4 of it is on gravel roads, ridden non-stop! This “test ride” was a true adventure that pushed both rider and bike to their limits. It was an amazing experience in every way. We bring you the full report, plus an in-depth evaluation of the bike and the new SRAM disc brakes. 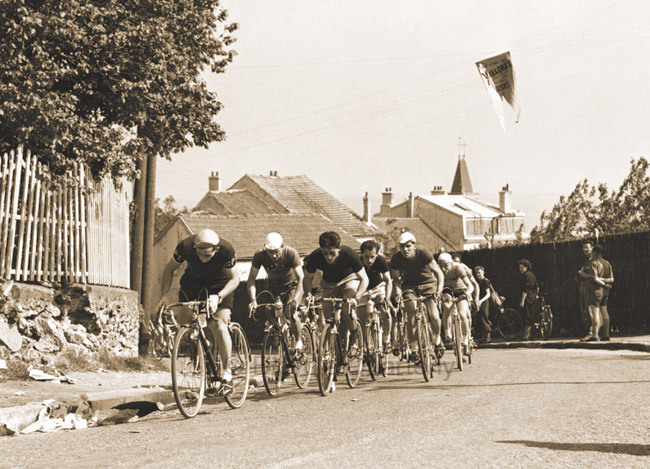 During my research on the Poly de Chanteloup, I talked to many of the riders who had competed there. Lyli Herse was fastest in the tandem category no fewer than 10 times. She told me that she wanted a ride around the course to celebrate her 85th birthday. So we took a René Herse Chanteloup tandem and did a lap of this challenging course. It was a moving experience for all involved, and it gave me a new appreciation of that event, as well as of Lyli as a rider. Even at 85 years of age, her contribution toward moving the tandem over this challenging course was far from negligible. Those are just some of the highlights. This issue also starts two new regular columns. In the “Skill” column, we explain how to look behind without wobbling. “Icon” brings a close look at the classic Cinelli fork crown. We also show you how to equip your bike with a more effective mudflap. All this and more is in the Autumn 2013 Bicycle Quarterly. Click here for a complete table of contents or here to subscribe. A question about the Calfee. Couldn’t you have run 650b on the Adventure you tested previously? I have done this on my own Adventure, swapping in even 26″ mtn bike wheels as a experiment. The Calfee Adventure we tested two years ago had rim brakes set for 700C tires. Calfee actually had been wanting to get us a 650B test bike with disc brakes, but they didn’t think that disc brake technology for road bikes was up to their standards yet. That finally has changed. Ah yes, I forgot the rim brakes, as I ordered mine w/ discs. Mine work pretty darn well (Avid 5’s), and the difference when riding another bike with rim brakes is noticeable. Can’t wait to see the new color issue, though I must admit I always thought the black-and-white look gave the magazine a certain charm and elegance. That being said, any thoughts about taking some of the great back issues and making color special editions where possible? I know I would find them hard to resist! Redoing the old issues in color would be difficult. The photos were chosen specifically for B & W reproduction. Obviously every picture does not need color. 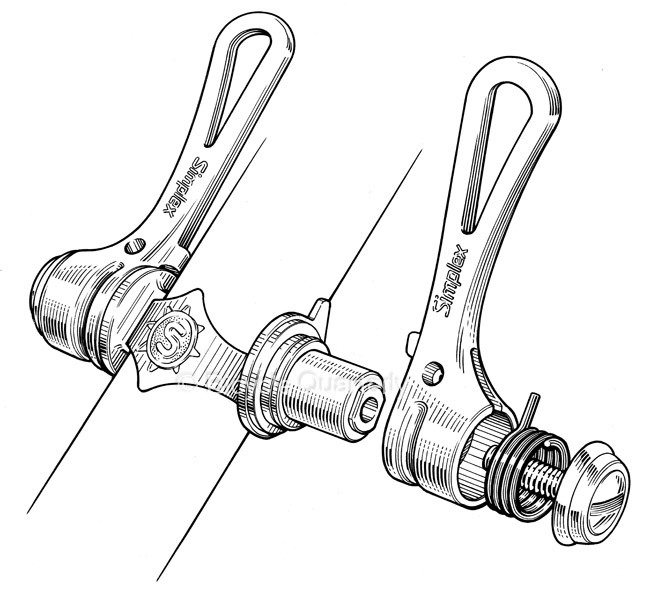 Just like the line drawing of the Simplex friction shifters makes it easier to see how they work, color in a picture can, sometimes, be too much information. Black and white has the ability to better focus attention to whatever is intended by the picture. Also, esthetically, lack of color leaves more to the viewer’s individual interpretation. But color can be oh so beautiful. Will the color printing hold up over time as well as the black and white? We love black & white, and even in the new issue, you’ll find plenty of beautiful b & w photos and illustrations. However, neither the cover photo nor the one with Mount Adams in the background would have looked as expressive in b & w.
As far as long-term durability, I don’t foresee any problems. Bicycle Quarterly will continue to be printed on archival acid-free paper, and the dyes should last well, too. Light is the enemy of color dyes, but you don’t usually store your magazines flipped open in plain sunlight. The visuals will now match the quality of the content. I will read the Calfee and disk brake review with great interest. Was that a customer’s spec who loaned their bike to you? Or did Calfee spec it for the show? Or did Jan spec it? Combination? It sure has the look of somebody thinking really hard on a mix of the modern and the classic. The bike was spec’d by Calfee. It’s not a customer bike, but was built for the Interbike show. The bike was ridden in the Super Randonnée, and then the photos were taken. So the frame number was still on there for that reason. Does that make it “look cool”? I think the race number does look cool, particularly if Calfee plans to show the bike at Interbike that way. I admire show bikes that have been ridden on great rides, very similar to the Technical Trials stories you have shared with us over the years. Here is a no-holds-barred SHOWBIKE, that is a decidedly modern take on a classic bicycle style, optimized for that type of riding, and THIS VERY BIKE was ridden at this particular event. I think that is super-admirable. I would say that does NOT constitute a violation of Rule #75 and is very cool. I searched online for the “Volcano High Pass” super randonnée, but this page seems to be the only reference. Can you share a link to a map or gps track? It sounds fantastic. It’s one of the Super Randonnée 600 organized under the auspices of the Audax Club Parisien. The course can be found here, and I look forward to having you come and ride it. Color? What’s next, moveable type? Calfee carbon frame, but disc brakes; a rack, but deep carbon rims; straight legged carbon fork, but a Brooks saddle. It’s an ultimate mutt — the best breed of all! Color! Fantastic! I was wondering if you might do this. Although I think you should only do as much as you can afford (and still gain circulation)–perhaps a just a color cover and a color of a classic bike or classic ride. But great. I bet the advertisers are happy and more power to you. I’d like to see a terrain graph drawn to scale (or a at least MORE to scale). Not just for your Volcano High Pass 600 km Super Randonnée, but any stage of the TdF or any stage race. I have to keep on telling myself the graph is not to scale, but if it was, we’d be ripping our fingernails out walking our bikes up every mountain and falling off the cliff going down! Have you or anyone else ever done this to any degree? For example, on a Mt. Ventoux stage on the TdF, I know it’s a hellish climb in real life, but what does it look like on the graph?–I’ll bet that hellish climb looks only hilly, which goes to show how weak our puny bodies really are against nature’s terrain. Any resource you can point to? Good luck on all in everything. 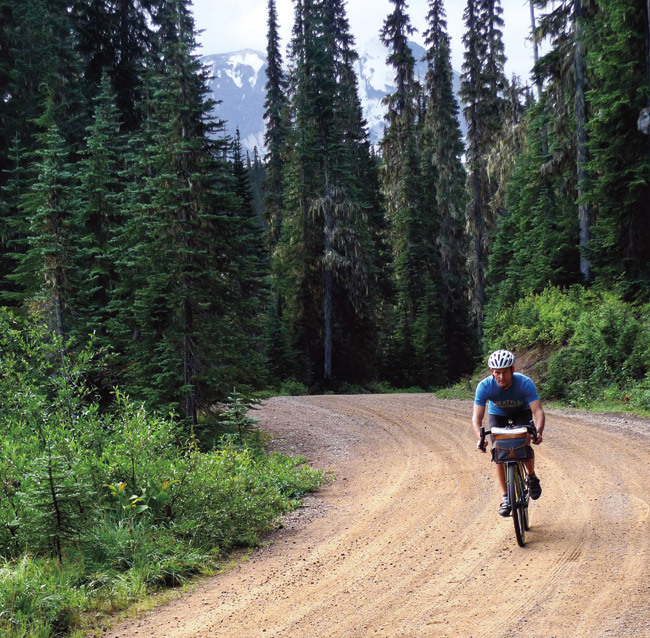 Bicycle Quarterly isn’t financed by advertisers, but by our readers. The reason to do color is simple: The beauty of the rides and of the bikes we feature deserves to be shown in color. If you drew a graph of the terrain with the vertical and horizontal scale being the same, it would basically look flat. Even a 10% slope rises only 10 m over a 100 m length. When you ride it, it doesn’t feel flat at all, though! The simple explanation is that the horizontal distances on the earth are huge, the vertical ones small. Look at a globe. It is a sphere that does not have bumps for mountains, but it actually is a good representation of the earth. On a globe with a diameter of 30 cm (1 foot), even Mount Everest would only be 2 mm (a little over 1/16″) tall, if you made the mountains to scale. Yes, indeed. Looking back on what I said, I know it sounds pretty trivial. It would be boring to see a WHOLE stage drawn to scale. But I would settle for the climb part of the Mt. Ventoux stage drawn somewhat to scale. Maybe that would urge me to get on up there, telling myself “it can’t be THAT hard, it’s looks fairly decent on the graph!” And yet, I know it’s SO tough–poor Tom Simpson is testament to that! — With apologies to F.S.F. ! Actually, I think it might be even less: ~0.2mm! 942/40,000 ~= .024mm / Km. Everest is ~9Km tall => ~0.22mm. What is even more astonishing to me is that the stratosphere (which reaches an altitude of ~50Km) is a layer just 1.2mm thick on a 30cm globe! You may have covered this in the next issue in which case I can wait to read it. I was curious what you thought of the light placement on the Calfee? It looks as though your bag may have blocked it a bit. I do believe on your bike its attached to the rack. Do you have a preference one way or the other? Did the Calfee have a generator hub? The Calfee did have a generator hub. The article includes a detailed review of the Exposure headlight and generator. I do believe on your bike its attached to the rack. Do you have a preference one way or the other? Speaking of the rack, I was interested to see it’s mounted to mounting points on the carbon fork. I recall Calfee’s comments re: the inadvisability of mounting racks to carbon directly (vs with P clamps that could shift) due to carbon’s brittleness in the event of the bike falling over in his response to your review of the earlier bike. What’s changed to make it advisable now, when it wasn’t a good idea then? You’d have to ask Craig Calfee… From what I can see, the stays for the rack are aluminum, and I think they’d bend before the carbon cracks. 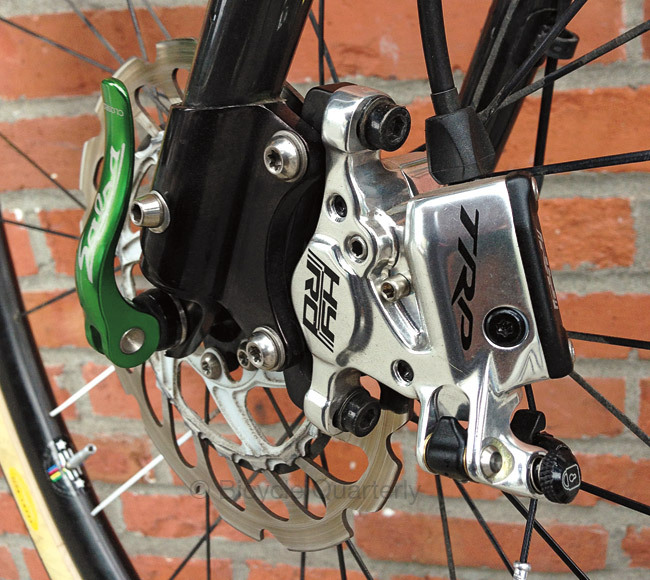 I thought the whole point of a hydraulic brake was to ELIMINATE the metal cable…? This brake seems the worst of both worlds! To me, what matters is how the brake works on the road. If it has excellent power and modulation, I don’t care whether it is comnected to the brake lever by a cable or a hydraulic line… I had heard good things about this brake, so we decided to try it. I agree with you, Jan. The proof of the pudding is in the eating. And I admire the picture of the brake the way I admire locomotive wheels and trains in general, which I’m also really into. But train parts can look pretty “brutal”, and this disk brake, too, while it has a certain beauty to it, still looks pretty “industrial”, if you get my meaning. It’s kind of remarkable, don’t you agree, that rim brakes turned out to look so beautiful while ALSO performing well. The aesthetics of bicycles are an interesting topic. They have changed so much in recent decades, from whispy frames and components that conveyed the lightness that was the goal in their design to large surfaces adorned with huge logos more reminiscent of racecars. Modern materials have made it possible, but I think there also is a change in aesthetics. It used to be that a bicycle, like a steam locomotive, expressed its function through its form. You could look at a bike and figure out how it worked: The shift lever pulls the cable, which pulls on the derailleur from that side, and thus moves it over to shift the gears. A modern brake/shift-lever is like a black box by comparison. You push this button, and the gear will change, in a somewhat mysterious way. Despite all the thought Calfee put into this bike, they have followed the herd with the brake mounted unsafely on the wrong side of the fork. The force on the rotor tries to eject the wheel from the dropouts. If the brake were on the front of the fork blade the brake would pull the wheel into the dropouts. Lawyer lips would be unnecessary. While it is true that conventionally-mounted disc brakes have proven safe enough in practice, and indeed I ride with some, it would be good if a top-end builder led the way and eliminated this unnecessary danger. Darn! Now you’ve got me looking at the Calfee site, and now we are already one generation behind on road tests. The Manta Pro Adventure is what I really want to see. It’s got rear suspension, that maybe would plane for you. That would be cool. Plus, these developments give plenty of options for those of us who are shopping for a $12 – $16k randonneuse or sportif. $6000 Manta pro F+F, $2500 wheelset, $2500 SRAM Red22 group, plus a few other parts. That gets into that $12,000 range right quick! There is no doubt the Calfee is expensive. 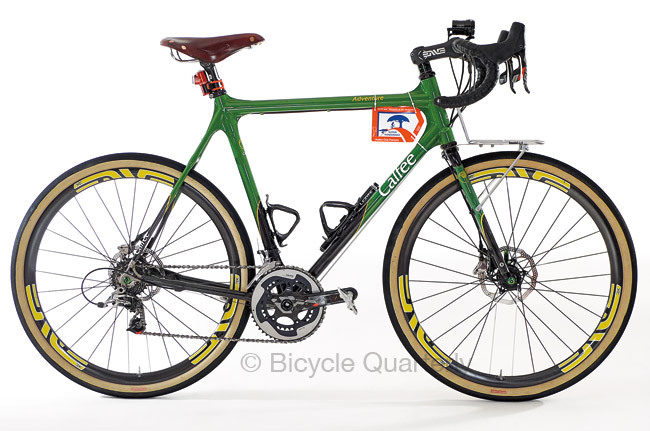 It’s spec’d with cost being no object, to see what a modern 650B randonneur bike can be. I think it’s useful to tests “the very best.” It provides a benchmark of what we can expect from a bike. Perhaps more importantly for most riders, we also evaluate which parts affect the actual ride quality and speed. For example, if it’s the frame, then you could forgo the expensive wheels and high-end components and get a bike that performs as well for much less. If the wheels make a huge difference, then they may be worth the price. And so on. OK, you’ve sucked me into a subscription. The ONLY printed thing I happily pay for has been the excellent Rouleur. The wonderful Simplex illustration was the final straw! Thanks to readers like you, we now are able to commission original artwork, in addition to reprinting old illustrations from artists like Daniel Rebour, Frank Patterson and others. There’s a special, tactile, almost sensual pleasure moving the chain around via these levers, something totally missing from indexed systems.